The next morning, sipping coffee and gazing out our 6th story window, Debra pronounced the city mysterious. She was referring to it's elusive quality, it's reserve. You have to pursue her, you have to work hard to find her hidden charms. Chicago is out there -- you don't have to look hard for a good time, she's bold and assertive, offering herself up to you quite willingly. Los Angeles is undemanding, available, free - what you see is what you get, whatever you are is perfectly fine, be free. Boston is discreet, a lady. She's all charm, manners and history at first glance. You have to dig deeper to get to know any other aspect of her, she's not cheap. But Atlanta, yes, Debra, Atlanta is mysterious. She leaves you scratching your head and saying "What??" Or, as Eva says, "What the World??!" You have to peel back layers, spend some time to get to know her, navigate vague maps, wander large, empty buildings. She has something for everyone, but you might not find it. You have to get to know her and work hard for her favors. She's like the smart, plain girl, full of interesting possibilities and personality if you just take the time to get to know her. 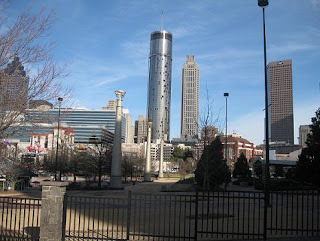 In the next few days I hope to get some posts written about some of Atlanta's hidden charms. But for now.... I must hit the streets. She beckons.